Many home cooks won’t hesitate when asked to whip up a batch of muffins, partially due to familiarity, but predominantly out of time and ease. Many muffin mixes currently on the market take no longer than 10 minutes to prepare and bake; start to finish. I won’t deny that pre-packaged mixes are easy and require little to no time or thought, but have we lost sight of how simple and versatile a muffin recipe can be? I’ve found most muffin recipes don’t veer much from the traditional blueberry, chocolate chip or crumb and I wanted to do something I hadn’t seen before. So I set out to make a muffin recipe with a simple batter and intriguing flavors. Anise and fennel came to mind as the brainstorming began. I considered anise for a while but ultimately decided against it as it tends to be very polarizing for people. Fennel seemed like a promising flavor that still packed a challenge. So the research and testing began. I started by testing different flours and batters. I compared all-purpose, whole wheat and almond. It didn’t take long to determine that an entirely almond flour muffin was out of the question, the weight of the flour created a very dense texture. I then tried half all-purpose and half almond flour. It was better, but still not quite what I was looking for. Additionally, I tried whole-wheat flour, and after a few tests it turned out great. I was happy with the texture and flavors, but it seemed to lean towards the healthy breakfast option. 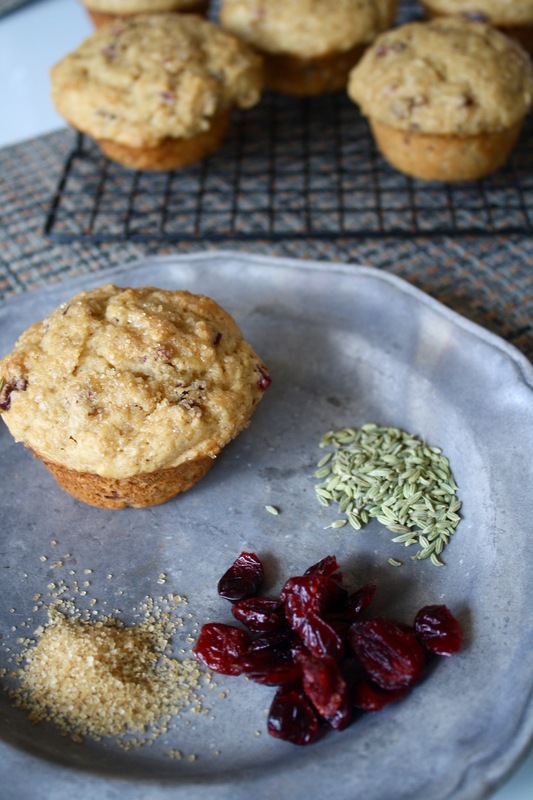 I love a healthy start to the day but for this recipe I was looking for a classic muffin base with new flavors. So I turned to all-purpose flour. 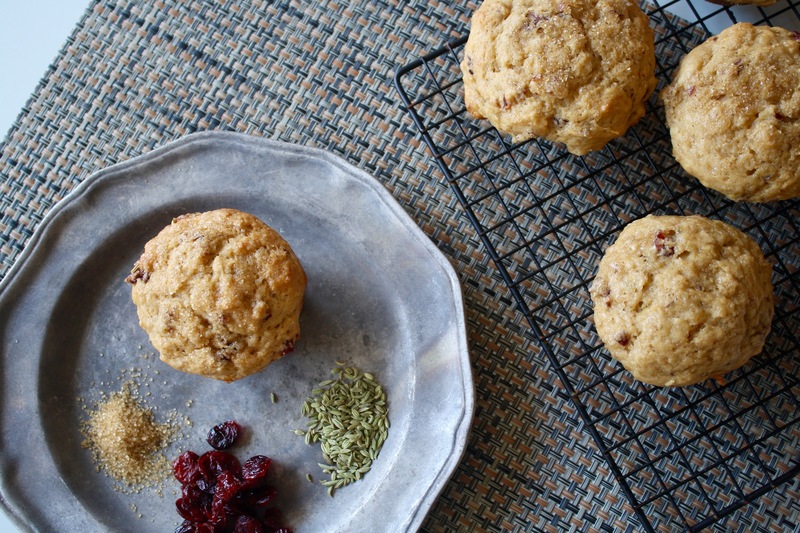 Looking for a whole-wheat muffing? Check out this version. 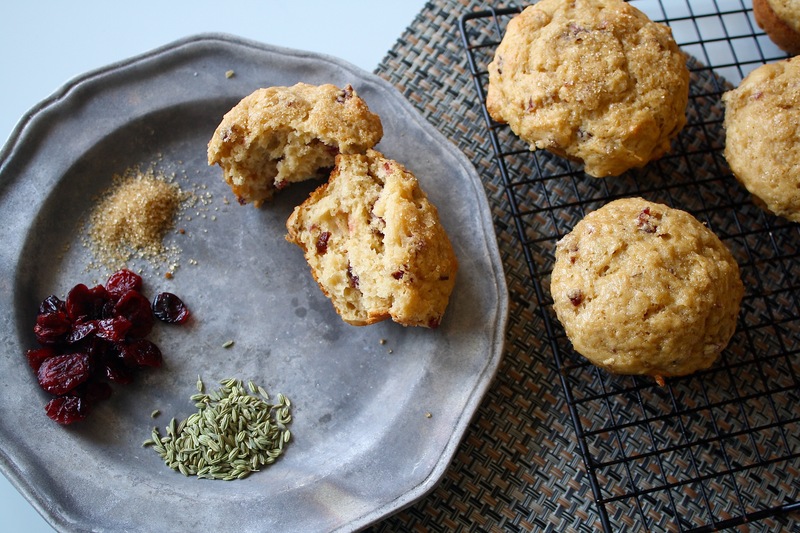 I knew I wanted to use fennel in my muffin so I began by testing different forms. I used shredded fennel bulb, whole fennel seed and ground fennel seed. Each form providing a different angle to the muffin. I began to wonder if I could combine all forms into one recipe. So my next task was to create a muffin that included shredded fennel bulb, fennel seed and ground fennel seed. In comparison, I made a recipe that swapped shredded pear for the fennel bulb, keeping the spices the same and tasting side by side. Unexpectedly, I found that pear brightened the fennel flavors, giving the muffin more depth of flavor. I also noticed that shredded fennel created a texture similar to zucchini bread while shredded pear maintained a light fluffy texture. I decided to go with pear not because the flavor was prominent but because it enhanced the fennel flavor while keeping the classic muffin texture in tact. Now it was time to nail down the spices. From previous tests, I knew I wanted to use both whole fennel seeds and ground, but I needed to find a way to enhance them. I found that using raw fennel was somewhat bitter and astringent, reminding me of a spice rack. If toasting nuts can deepen their flavor why couldn’t it do the same for fennel? So I took whole fennel seeds and toasted them in the oven at 350°F for about 10 minutes until lightly browned and fragrant. I then ground half of the toasted seeds and used both forms in my muffins. The fennel flavor became smoother and more dynamic. Out of ease of preparation, I began to wonder if it was necessary to grind the fennel seeds or if using pre-ground fennel would do the job just as well. I needed to find a way to toast the ground fennel where it would create the same smooth flavor as it had when toasted whole and then ground. I tried a couple methods of doing this. First, I individually toasted whole fennel seeds and pre-ground fennel in a small saucepan before adding them to the batter. I also tried blooming pre-ground fennel in oil before adding it to the batter. Expecting to find only minor differences in the batches, I was greatly disappointed in the pre-ground fennel. Using it raw, toasted or even bloomed did not lend the same flavor as the toasted fennel that I ground myself had. This extra step would have to stay. Throughout testing I had been using fresh squeezed orange juice as an aid to stop the oxidation of the shredded pear. Using just a couple tablespoons of juice to get the job done, I began to wonder if that could act as another flavor profile to the muffin. Increasing the amount of juice did not have an effect on the flavor. The zest however, drastically changed the profile of the muffin. Adding 1 teaspoon to the whole batch completely over powered the other flavors of the muffin. Lemon juice seemed to be a promising swap for orange juice. With a stronger and more prominent flavor it could add brightness, but I knew I had to be careful with it. Too much and it can be over powering. Side by side I tested two batches, one containing just lemon juice and another containing lemon juice and ¼ teaspoon lemon zest. I wanted just enough to freshen the flavors while not turning the muffin into a lemon flavored cake. I was pleased with the clean flavor lemon provided to the muffin while not being too overpowering. The muffin containing the zest was not overly lemon flavored and seemed to have a great balance of flavors. So orange zest was out and lemon was in. Lastly, the muffin needed a little punch; I choose to incorporate finely chopped dried cranberries due to their sweet-tartness. They were the perfect addition for taking these muffins to the next level. Right before baking I top each muffin with a sprinkle of turbinado sugar for a little sweet crunch. 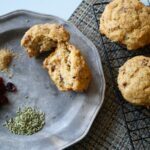 These muffins are great served alongside a warm frittata for a weekend brunch or for kicking up a simple weeknight meal. Why this recipe works: Whisking the egg and sugar together and allowing the mixture to sit for a few minutes gives the sugar time to dissolve. I also chose to use low-fat yogurt to create a nice fine crumb and to add some tang to the muffin. Adjust oven rack to middle position and heat to 350°F. Spray muffin tin with cooking spray, making sure to spray the edges around the cups as well. Spread fennel seeds onto sheet pan and toast in oven for 10 minutes until lightly toasted and fragrant. Remove pan from oven, transfer seeds to a small bowl and allow to cool. When seeds have cooled, measure out 1 tablespoon and set aside. Transfer remaining seeds to a spice grinder and process until it is finely ground. Measure out 2 teaspoons and add to fennel seeds. In a medium bowl whisk together egg, egg white and brown sugar until pale in color. Set aside and allow to sit for 5 minutes until mixture becomes foamy. In a small bowl mix together shredded pear, zest, lemon juice and cranberries. Add vanilla, yogurt, oil, fennel seeds, ground fennel and shredded pear mixture to liquid ingredients. Mix until combined. In a large bowl whisk together flour, baking powder, baking soda and salt. Form a well in the dry ingredients and add wet ingredients. Mix, folding until just combined and no dry flour is visible. Spoon batter into cups and fill to top. Sprinkle tops of muffin with turbinado sugar and transfer pan to oven. Bake for 18–20 minutes or until tops of muffins spring back when lightly touched. Remove from oven and allow muffins to cool in the pan for 5 minutes. Serve warm or transfer to wire rack to completely cool before storing in an air-tight container. Can be stored for up to three days. If you do not have a spice grinder you can use pre-ground fennel and whole fennel seeds. Toast the spices separately in a small saucepan. The seeds will take about 5 minutes over medium heat and the ground fennel 2—3 minutes on low heat. Toasting and grinding the fennel in this recipe if key to developing great flavor. If you don’t have a spice grinder you can use a mortar and pestle to grind the fennel seeds. 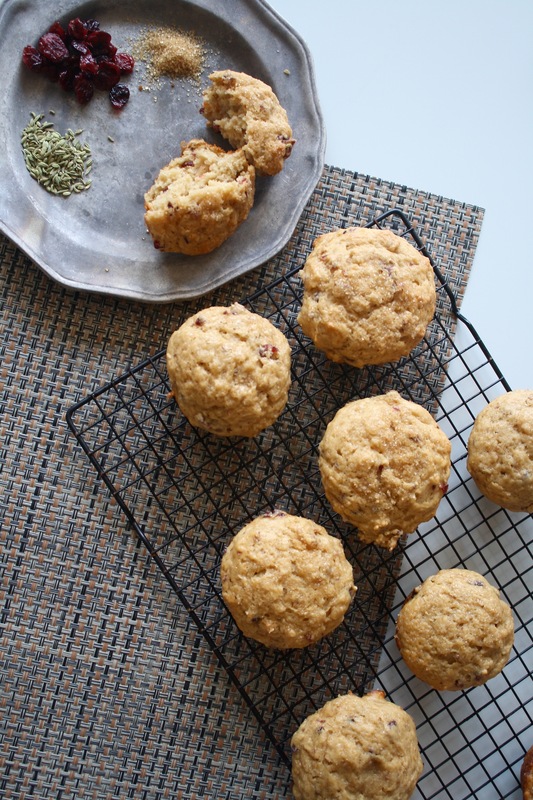 Just expect your muffins to have a “seedy” texture. You can also use pre-ground fennel along with the fennel seeds if you prefer. This recipe will still work if you do that, but it has best flavor when freshly ground. Wow, this is such a unique combination of flavors! Your photos are great, and I love the plate! I have one similar.